It’s Superbowl Sunday and I am a huge fan of the snacks and the food us Americans enjoy today. There are special displays in grocery stores set up for people buying food for the Big Game. Usually they are built out of beer and soda with lots of snacks intertwined. I managed to walk by the Oreo shaped footballs, but couldn’t resist trying the new Doritos flavors. Doritos are always “delicious”. I think it’s the perfect blend of salt, cheese, MSG, disodium inosinate and disodium guanylate that this brand of chips has. Used in very small amounts, flavor enhancers (MSG, disodium insinuate and disodium guanylate) give a delicious full-bodied flavor to products. My entire family enjoyed the sour cream & onion chips. Surprisingly so, since my husband doesn’t really like sour cream. These Doritos were perfectly balanced with creaminess, tanginess, saltiness and heat. They were great for scooping out homemade guacamole on. The entire bag was eaten. 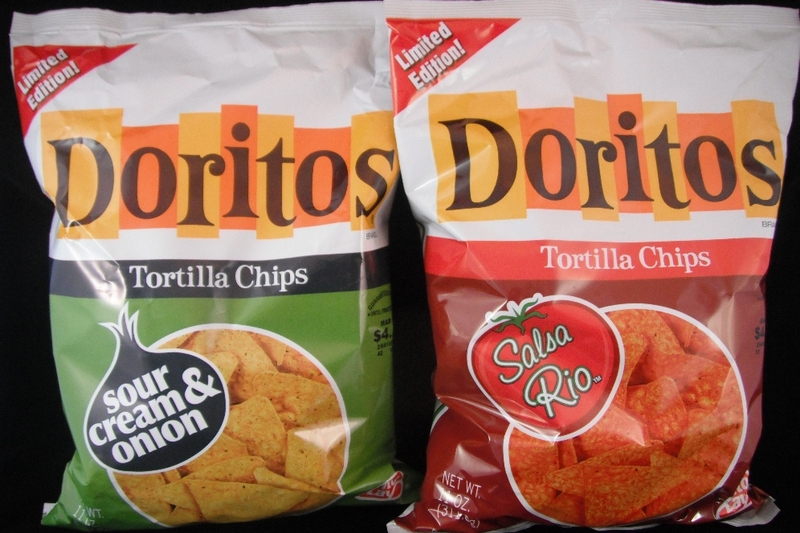 The Salsa Rio chips weren’t so well liked. Personally, I have an aversion to the smell of these chips. The aroma is chemical (methoxy isobutyl pyrazine: used to make bell pepper flavor). It’s a smell that never goes away and lingers on everything. The bell pepper aroma is what the wine industry terms as cloying (to cause distaste by supplying too much of something originally deemed pleasant). Besides the chemical note, these chips are very hot, tingly and sour; something my children don’t care for. I don’t think we’ll be able to finish the bag of Salsa Rio Doritos. Something went wrong with these chips. If we throw out a few chips, that’s fine. We have to leave room for the BBQ ribs and homemade cookies we are having later tonight. I just love Superbowl Sunday!